Tell attendees they’re event is going green and the news fills their heads with images of eating with appetite-killing biodegradable spoons and forks, water-coolers instead of bottled water at coffee breaks, and paperless programs. All of that is all part of the experience, and an important part too. But there are also entertaining aspects to going green that can make being a good corporate citizen fun. 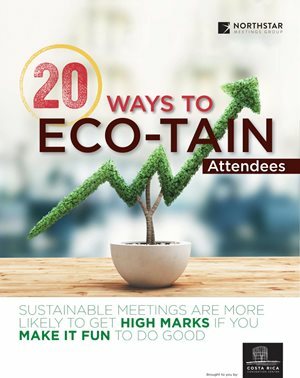 Before you can begin to consider introducing eco-tainment to your meeting or event you’ve got to start with a basic sustainability program. Here’s how to get that up and running..
Tell attendees their event is going green and many think of biodegradable spoons and forks, water-coolers instead of bottled water at coffee breaks, and paperless programs as part of the experience, and an important part too. But there are also entertaining aspects to going green that can make being a good corporate citizen fun.